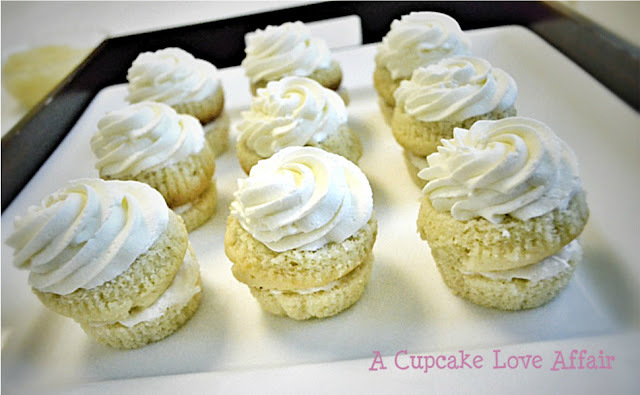 A Cupcake Love Affair: Coconut Cream Cupcakes - Light & Refreshing for Summer! 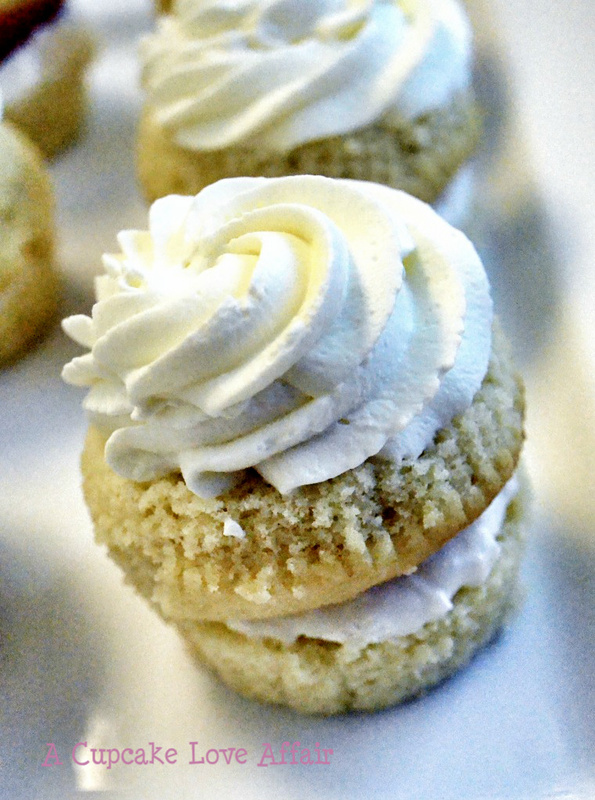 Coconut Cream Cupcakes - Light & Refreshing for Summer! Hey friends! We celebrated another birthday at work last week and it was delicious! To say that the birthday girl LOVES coconut would be an understatement. She adores it. She talks about it all the time. In fact, everything she got that day had something to do with the stuff. Her husband started her day off with her favorite coconut candy. She got to work where I had coconut creamer for her coffee. Then, of course, the special cupcakes I made for her were....yep, Coconut Cream cupcakes with a pineapple and coconut cream filling. We also had vanilla ice cream and crushed pineapple to go on top. I wanted to do these a little differently to make them more special for the birthday party. I pulled the liners off the cooled cupcakes and cut them in half horizontally. I then put a heaping tablespoonful of the filling on the bottom layer, cut a whole out of the middle of the top layer, placed it on the filling, and then filled the hole with crushed pineapple for an extra layer of flavor. Pineapple and coconut - such a classic summer flavor combination! I piped the coconut whipped cream on top of the whole thing. 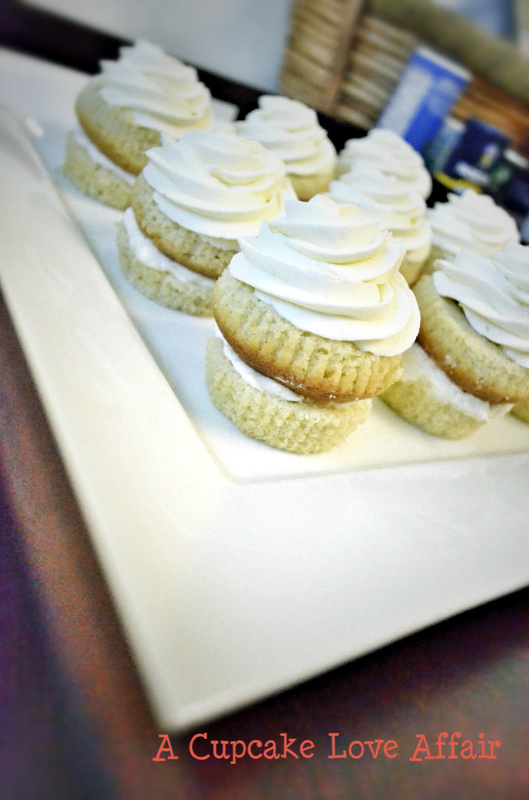 The cupcakes look like mini layered cakes and everyone really loved them! Combine dry ingredients and add alternately with milk and creamer. Add vanilla last and stir until combined. Bake at 350 degrees until lightly golden brown and toothpick inserted in middle of cupcakes comes out clean. Whisk sugar and sour cream together. Add vanilla extract and coconut and mix until combined. Meanwhile, whip heavy cream and creamer until stiff peaks form. Fold whipped cream into coconut mixture until just combined and fluffy. Whip ingredients together until stiff peaks form. These were really delicious, fun to look at, and very refreshing. I definitely recommend them for a summertime get together! Hope you enjoy!! 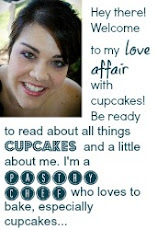 As always, happy reading and, more importantly, happy cupcake-ing! I love how you gussied these up. Slicing them in the middle makes them look so much more fancy and fun. I'm definitely pinning these. Thanks for sharing at our party this week. Thanks for hosting again, Bree! Either way it'll be delicious! So perfect for this time of year! Hi! I discovered your blog thru Char's Blog hop! Your blog is amazing plus you're just adorable. Note to self, don't visit your blog when I'm hungry! Lol. YUMMY!!!! I wish you lived next door to me:) I would visit all the time!!! Thanks so much for sharing @ Two Sasters!! I wish you did too! There'd be less for me to eat around here! :) Thanks for hosting! Thanks so much for linking this yummy post up to my Say G'Day Saturday Party. I just tweeted about it! Thanks so much for linking up your yummy recipes to Creative Thursday this week. These look amazing! Funny that you posted this because I have been on an Almond Joy creamer kick and was wondering if I could use it in any baked goods. Thanks for sharing. Oh I really want to make these for a party I am going to next month. But I'm not sure I can find the coconut creamer around here. Do you know of something I can substitute for it? You could try coconut milk but I can't predict the results. I'm not really familiar with it but the creamer has sweetener in it so if coconut milk isn't sweet, then it may change the flavor. You can always use regular creamer and add coconut to the batter. Hope this helps and they turn out! I know you already saw your feature, but thanks again for linking up to Topsy Turvy Tuesdays! I really do think these look and sound delicious! Strawberry Rhubarb Pie in a Cupcake!